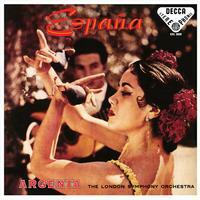 Most classical devotees know that Espana! features legendary Spanish conductor Ataulfo Argenta leading the London Symphony Orchestra in a program of so-called "Spanish" blockbusters. But, ironically, only one piece is penned by a Spanish composer (Granados, "Danza Espanola") while the others are by a Russian (Rimsky Korsakov, "Capriccio Espagnol"), German (Moszkowski, "5 Spanish Dances"), and Frenchman (Chabrier, "España"). The LP version was initially issued in the United States as one of the index recordings of London Records' vaunted "blueback" series, known for its demonstration-quality sound.